My brother's first little Pumpkin is finally old enough to enjoy some pumpkin carving (notice how she can't keep her hands off them), so this year they're having a carving party for the family to celebrate. I won't be there for the party, but I figured I could be there in spirit with a new hat. 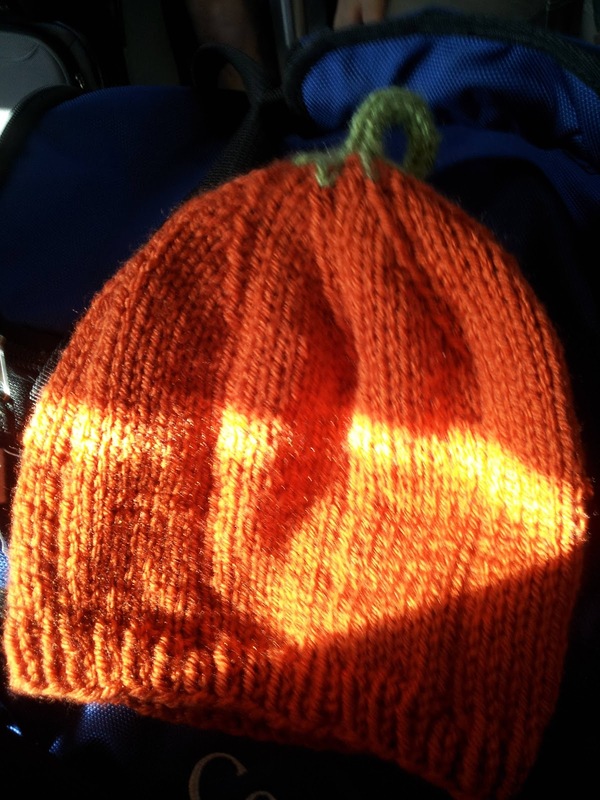 There are a lot of pumpkin hat patterns out there already, but I wanted to come up with one myself to kill time on my latest flight. My goal was to come up with the pattern and knit it during my 2 hour stint in the air, and I'm pretty pleased with the results. 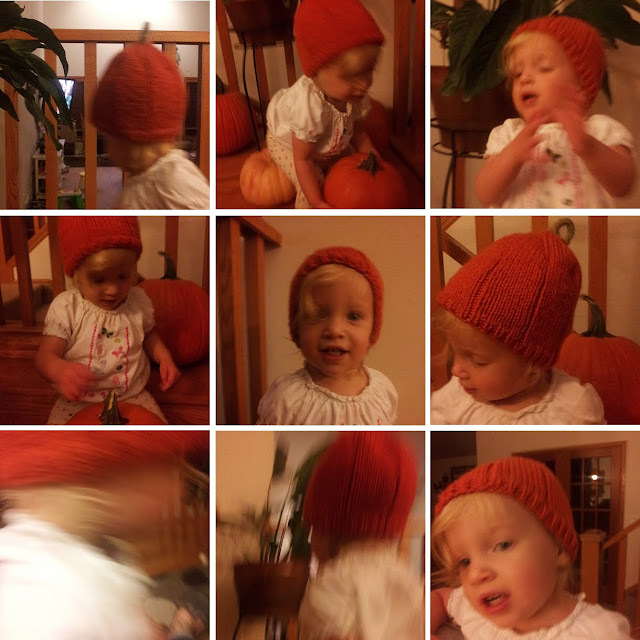 How fast can you knit this hat? Well, I did it at 600mph, so.. pretty quickly. 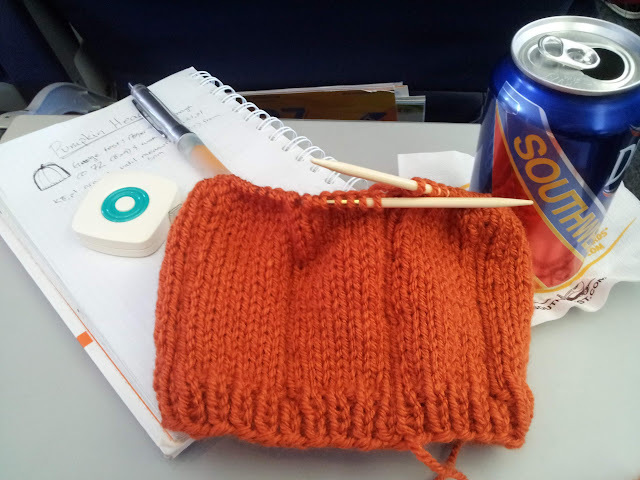 I frogged my swatch and cast on the hat as soon as I sat down for my flight to Denver. I was starting the i-cord when I stepped off the plane (which landed 20 minutes early, by the way). 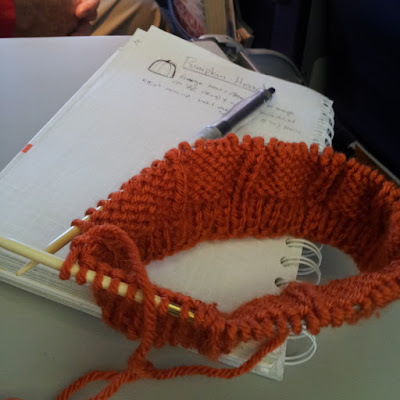 By the time I was getting onto the shuttle to pick up a rental car, I was weaving in ends. This hat is QUICK. This hat is knit from the bottom up, starting with a simple k1, p1 rib for the brim and a wide rib for the body. The hat decreases nicely into an i-cord, which is looped over and attached to the top of the hat to maintain a nice little curl. 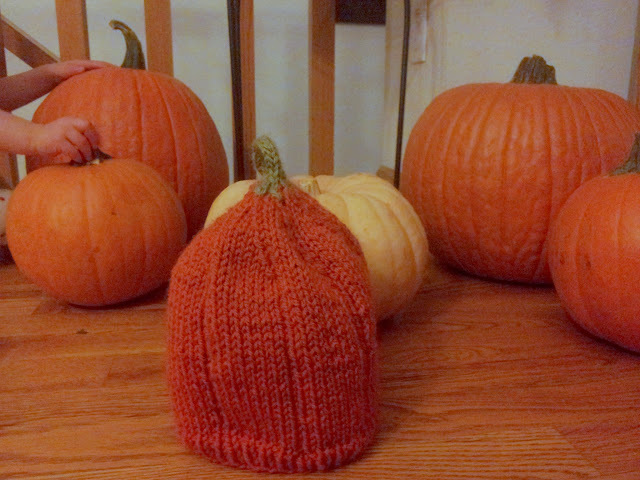 There's some very basic colorwork at the end of the hat when transitioning to the stem's green color. It's very stretchy and will easily fit toddlers to young children. Work 4 rounds with a k1, p1 rib. Starting at the beginning of the 5th round, work: * k8, p1, around from *. Work this wide ribbing until the hat measures 5.5" from the cast on edge. There are 17 rounds to the decrease. Towards the end of the decrease you switch to your green color. Starting now, knit the column with the ssk's with the green color. Stitches knit in green will have a G following them. Drop your orange yarn and now work only with green from here on out. You should have 4 stitches left. Continuing with green, knit 8 rounds of i-cord. Then work one round as k, k2tog, k to reduce your stitches to 3. Then work 2 more rounds of i-cord. Bind off. 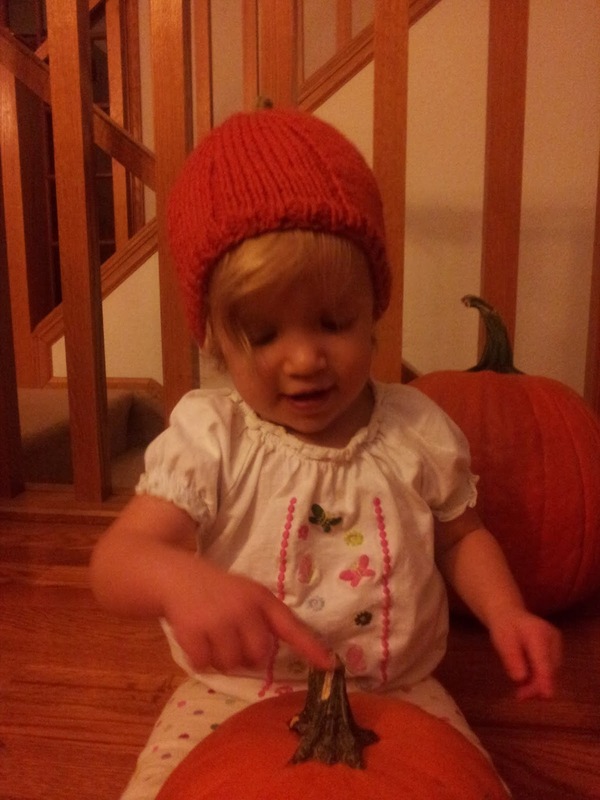 Attach the stem to the top of the hat to create a loop. Plop on your little pumpkin and try to get a picture. Try. The best part is, she says "Cheese!" right as she looks away from the camera.